A long-lasting staple of the DC line, The Brave and the Bold told the stories of DC’s mightiest team-ups for nearly thirty years before its cancellation in the early 1980s. Now more than a year into its second run, the series has once again turned its attention to team-ups, featuring a good blend of established characters and lesser-known faces. 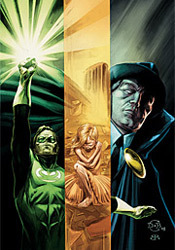 This month, for example, features an intergalactic SOS that’s answered by both Hal Jordan and The Phantom Stranger. Sounds like business as usual, right? Well, here’s the catch: that cry for help from a far-away galaxy was conveyed a brain-dead child in a West Virginia hospital. Cast in the unenviable role of a placeholder, biding time with the series until J. Michael Straczynski takes over in 2009, writer David Hine is nonetheless making the best of his limited window of opportunity. This issue’s story, an unexpected blend of horror, sci-fi and medical drama, is both smart and interesting. While Hine has a tendency to lose himself in scientific detail, especially during the set-up of the issue’s first few pages, such moments lend the story authenticity and immediately deliver the sharp, distinctive tone that flows from cover to cover. This writer displays the ability to deliver tremendous detail and sobering circumstance with only a few panels of explanation and a minimum of dialog. He’s done a lot of research, added a few original twists of his own and compressed it all into a format that’s brief but powerful. When the narration leaves the Earth, Hine’s imagination really shines. While the story itself has a very specific underlying purpose, the author still takes the opportunity to stop and smell the roses so to speak, enveloping his readers in the culture and personality of a heretofore-undocumented alien world and noting its similarities to our own. If the spectacular adventure of the primary story weren’t so good, I could get lost in the minutiae of this alien culture without qualm. Such attention to detail and care is unusual, especially from temporary talent, and I’ll be keeping an eye out for more of Hine’s work in the future. Artist Doug Braithwaite is an equally imaginative, if somewhat less consistent, talent. Braithwaite’s strict, lifelike style is a good partner for the story’s stoic flavor, and delivers the straight, intellectual appearance that his writer was seemingly after. The artist’s renditions of the vast alien wilderness are fantastic, and his dramatic timing is top notch. My only misgiving lies with the drastic, and often distracting, level of detail that he brings to the page, which often hampers the book’s legibility. It’s a minor issue and one of personal preference, but an issue all the same. I was tremendously surprised and impressed by this issue. Oftentimes, the arrival of a star-studded creative team is immediately preceded by a series’ worst moments, filler work by creators with little time or investment in the book and its characters. That couldn’t be further from the truth in the case of David Hine and Doug Braithwaite. In the interim before the more widely anticipated arrival of JMS and company, this pair has delivered something to be heralded. It’s smart, compelling and well written, with a cliffhanger that has me anxious to see the resolution. Buy it and see for yourself.